HBOT involves breathing oxygen in a pressurized chamber in which the atmospheric pressure is raised up to 2.8 times higher than normal. Under these conditions, your lungs can gather up to three times more oxygen than would be possible breathing oxygen at normal air pressure. Patient might feel pressure in the ears while the pressure is increased in the hyperbaric chamber, but they will be taught methods to equalise this. This is a prescribed treatment and patient undergoing this treatment is closely supervised. Patient will be counselled by the doctor A comprehensive review of the patient’s condition is made. The patient is examined and assessed prior to each treatment. The risks involved in HBOT is also discussed with the patient. The most common side effect is barotrauma to the ears and sinuses caused by the change in pressure. To minimize this side effect, our technicians will teach the patient how to equalise the pressure and based on the feedback by the patient, also slow down the pressurisation to a comfortable rate. Patients may also experience temporary blurring of vision. As we are dealing with 100% oxygen, patients are reminded of the fire risks and how to avoid this. Air or gas embolism occurs when gas bubbles enter arteries, veins and/or capillaries. This results in reduced blood flow and poor oxygen delivery to the areas supplied by the affected circulation. If not fatal, gas embolism can result in severe, long standing and irreversible physical and emotional disabilities. There can be weakness or paralysis in the limbs, vision can be impaired and other organs damage. Limited use of remaining functions can be sufficiently sever that total disability result. These outcomes may be permanent and may severely impact quality of life. HBO2 is the primary treatment for gas embolism as compared to non-recompression treatment. Hyperbaric oxygen has been shown to reduce the size of bubbles obstructing circulation. The increased pressure in the hyperbaric chamber reduce bubble size and drives the remaining gas into physical solution, while the high oxygen pressure washes out inert gas from the bubble. When bubbles are smaller or resolved, blood flow resumes. Poorly oxygenated tissues then receive higher levels of oxygen delivery. When flow is restored, the local swelling will subside. Finally with the high levels of oxygen cellular oxygen levels is restored and blood flow impairment and tissue swelling are being corrected. Early treatment is important as prolonged circulation blockage by bubbles increases the amount of irreversible damage. CO is a colorless, odorless gas produced as a byproduct of combustion. Poisoning occurs by inhalation, either accidentally or intentionally. Approximately 5 – 6 % of patients evaluated in A & E Department for CO poisoning are treated with HBO. Research has also shown that there were a number of other mechanisms of toxicity from CO such as blood vessel (vascular) injury and central nervous system cellular injury. CO binds to hemoglobin in red blood cells usually utilized to carry oxygen to tissues. HBO2 accelerates the clearance of CO from the body thereby restoring oxygen delivery to sensitive tissues such as in the brain and heart. Gas Gangrene is an acute, rapidly progressive infection of the soft tissues. The infection is caused by one of the several bacteria in the ‘clostridium’ group. This infection typically spreads from a discrete focus within the body or also from outside the body such as infections resulting from contamination of wounds during trauma (for example in accidents). Gas gangrene infection is sever and can spread rapidly. Exotoxins are produced as a result of the infection and these exotoxins destroy healthy tissues in its path of advance over the course of hours. Clostridium bacteria are “anaerobic” meaning that they prefer low oxygen concentrations to grow. If clostridium is exposed to high amounts of oxygen, their replication, migration and exotoxin production can be inhibited. A course of daily treatments of HBO2 has the potential to slow the progress of the infection while the two primary therapies; antibiotics and surgical debridement of infected tissue control the spread of infection. The benefits of HBO2 in gas gangrene are firstly life-saving because exotoxin production is rapidly halted/slowed and secondly there is higher chances of healing and preventing limb amputation. Crush injuries occur when body tissues are severely traumatized such as in road accidents. Injuries usually occur in extremities such as in the limbs. When crush injuries are severe, there is higher chances of complications of infection, non-healing of fractures and sometimes amputations. When used as an adjunct treatment to orthopedic surgery and antibiotics, HBO2 increases oxygen delivery to the injured tissues, reduces swelling and provides an environment for healing and fighting of infection. HBO2 should be started as early as possible at the onset of injury and should be carried on progressively for a week or so. The success of hyperbaric oxygen treatment for DCI or AGE has been the standard care treatment for these two disorders. Occurrence is common when scuba-diving as, additional oxygen and nitrogen dissolve in body tissues. The additional oxygen is consumed by the tissues but the excess nitrogen must be washed out by the blood during decompression. During or after ascent this excess nitrogen gas can form bubbles in the tissues and symptoms are referred to as Decompression Sickness (DCI). Trapping of this gas within the lungs during ascent cause the bubbles to be forced into the bloodstream [also referred to as arterial gas embolism (AGE)] which then block the flow of blood or damage the lining of blood vessels supplying critical organs such as the brain. The symptoms exhibited are joint pain, numbness, tingling, skin rash, extreme fatigue, weakness of arms or legs, dizziness, loss of hearing, and in serious cases, complete paralysis or unconsciousness. Emergency treatment of DCI or AGE includes administration of HBO2 and measures to maintain adequate blood pressure, such as lying the patient down and fluid (either oral or intravenous, depending upon the severity of the illness. Even though evacuation of the patient to the nearest chamber facility may be delayed, it is possible to relieve the symptoms if treatment is administered within a few hours of onset. Some improvement might be expected particularly in mild cases, even after a day or more of delay. In most cases, patients suffering from DCI respond well to a single treatment of HBO2 but in very severe ones especially those with severe neurological injury, they may need multiple treatments to recover. In primary healthcare setting, wounds and foot ulcers should heal with meticulous care and wound dressing together with control of infection and control of underlying disease. If the wound shows signs of non-healing or deterioration, referral to a secondary health care facility such as a hyperbaric center, may be needed to prevent an amputation. How does the mechanism of HBO2 work? HBO2 results in a 10-15 fold increase in plasma oxygen concentration. This will provide immediate support to poorly perfuse tissue in areas of compromised blood flow to prevent further cell death and promote recovery. At the wound, HBO2 increases formation of collagen and new capillaries. This is especially important in diseases such as micro-angiopathy (from diabetes mellitus), late radiation-damaged tissue, refractory osteomyelitis and chronic ulcerations in soft tissue. Hyperoxia-induced vasoconstriction also reduces edema and swelling. HBO2 may also be beneficial where surgery is necessary for repair such as skin graft and flap. For skin critical to consider the following: that the recipient’s wound bed to be healthy and of quality to accept and nourish a graft. For the purpose of understanding HBO2 therapy in exceptional blood loss anemia, this condition is defined as loss of enough red blood cell (RBC) mass to compromise sufficient oxygen delivery to tissue in patients who cannot be transfused for medical or religious reasons. The intermittent use of HBO2 dissolves enough oxygen in the severely anemic patient to support basic metabolic needs until sufficient RBC is restored. Intracranial abscess (ICA) includes the following disorders: cerebral abscess, subdural empyema and epidural empyema. HBO2 may be of therapeutic benefit in these conditions where patients have multiple abscesses, abscess in a deep or dominant location, immune compromised and/or show no response or even further deterioration in spite of standard surgical and antibiotic treatment. HBO2 can be beneficial in managing intracranial abscess. The high partial pressures of oxygen may inhibit the flora growth (as they are predominantly anaerobic) found in ICA patients. HBO2 can cause a reduction in perifocal brain swelling and also has the potential to enhance patient’s defense mechanisms. Finally HBO2 has been reported to be of benefit in cases of concomitant skill osteomyelitis. The duration of HBO2 course must however be individualized, based upon the patient’s clinical response as well as radiological findings. The “flesh eating bug” and other dangerous bacteria can cause necrotizing soft tissue infections. Hyperbaric oxygen therapy is a recognized adjunct to surgery, antibiotic therapy and ICU care of these dangerous infections. Many studies showed that the development of hypoxia resulted in necrosis. Necrotizing soft tissue infections may result from a single strain or a mixed population of bacteria, typically occurring after trauma, surgery and/or around foreign bodies. Tissue necrosis occurs w with purulent discharge and gas production. Quantities of gas within the tissues are frequently seen in gas gangrene, crepitant anaerobic necrotizing cellulitis and necrotizing fasciitis. The individual affected by such infections is often compromised by conditions such as diabetes or vascular disease. The primary treatments for necrotizing soft tissue infection are surgical excision of infected tissue and administration of appropriate antibiotics. HBO2 may be beneficial in several ways. Some of the bacteria involved in necrotizing soft tissue infections are ‘anaerobic’, growing most rapidly in a low oxygen environment. In the hyperbaric chamber, tissue oxygen levels may be raised sufficiently to inhibit bacteria growth. In addition HBO2 enhance the ability of neutrophils to kill bacteria by a number of different mechanisms. Hence in specific and individualized cases, especially where risk of morbidity and mortality is high, adjunct Hyperbaric Oxygen therapy should be considered. Osteomyelitis is an infection of the bone or bone marrow usually caused by pyogenic bacteria. Refractory osteomyelitis is defined as chronic osteomyelitis that persists or recurs after appropriate interventions have been performed or where acute osteomyelitis has not responded to acceptable management techniques. HBO2 therapy is considered Class 2 by the American Heart Association in the management of refractory osteomyelitis. In most cases, the best clinical results are obtained when HBO2 therapy is administered in conjunction with culture-directed antibiotics and scheduled for thorough surgical debridement. Hyperbaric oxygen increases the oxygen concentration in infected tissues, including the bone and directly kills or inhibits the growth of organisms which prefer low oxygen concentrations. These effects occur through the oxygen -induced production of toxic radicals or through an indirect effect medicated through the white blood cells. Cancer treatment has improved significantly in past decades but side effects of cancer treatment especially a combination of radiation and chemotherapy can adversely affect the quality of life. Radiation side effects are generally divided into two categories: effects that manifest during or just after treatments (acute reactions) and those that happen months or even years after the treatment (chronic complications). The acute side effects almost always resolve with time and are treated in such a way as t address the patient’s symptoms. Unfortunately chronic complications often may not get better with time and are likely t get worse. Almost all chronic radiation complications result from scarring and narrowing of the blood vessels within the area which has received the treatment. If this process progresses to the point that the normal tissues are no longer receiving adequate blood supply, death or necrosis of these tissues can occur. Chronic radiation damage is called ‘osteoradionecrosis’ when the bone is damaged and ‘soft tissue radio necrosis’ if the muscle, skin or internal organs have been damaged by radiation. Since the 1970s, ENT surgeons have recognized the value of hyperbaric oxygen treatments in treating damage of the jaw bone due to radiation. 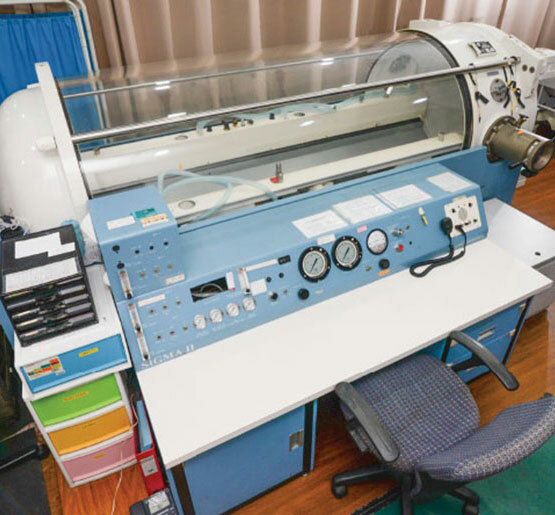 Hyperbaric oxygen has now been used to treat damage of the brain, damage of muscle and other soft tissues of the face and throat as well as damage to the chest wall, abdomen and pelvis and in some cases the bladder and intestine as well. Success of treatment varies with individuals. The impact of HBO2 is likely to benefit in the following three mechanisms: stimulates angiogenesis and improves tissue oxygenation, reduces fibrosis and mobilize and possibly stimulate an increase of stem cells within the irradiated tissues. For patients who faced with tissue compromised by irradiation or in other cases where there is decreased perfusion or hypoxia, HBO2 has been shown to be extremely helpful in flap salvage. HBO2 can help to maximize the viability of the compromised tissue thereby reducing the need for regrafting or repeat flap procedures. Thermal burn injuries can cause disastrous long-term physical and emotional disability for the patient. Burn injuries usually progress deeper and more extensive over time. In many cases, burn victim’s life is radically changed. Adjunctive HBO2 therapy has been known to limit the progression of the burn injury, reduce swelling, reduce the need for surgery and potentially lessen the risk of lung damage. Ideally the patient should receive 3 sessions of HBO2 in the first 24 hours, twice daily treatments until the process stabilizes and continued therapy as indicated for healing enhancement and to support grafting of skin areas. The best results are realized when HBO2 is used as an integral part of an aggressive multidisciplinary approach to the management of thermal burns. Idiopathic sudden sensorineural hearing loss (ISSHL) is defined as a hearing loss of at least 30 dB occurring within three days over at least three contiguous frequencies. The most common clinical presentation involves an individual experiencing a sudden unilateral hearing loss, tinnitus, a sensation of aural fullness and vertigo. The rationale for the use of HBO2 to treat ISSHL is supported by an understanding of the high metabolism and paucity of vascularity to the cochlea. The main oxygen source to the structures within the cochlear occurs via oxygen diffusion from cochlear capillary networks into the perilymph and the cortilymph. Patients with ISHL have been found to have very low perilymph oxygen tension. HBO2 can raise the perilymph oxygen tension sufficiently to help the recovery of hearing. The Cochrane Review, analysing multiple studies, showed that ‘for people with acute ISHL, the application of HBO2 significantly improved hearing.’ The use of HBO2 for the treatment of ISSHL is Class IIa (AHA Evidence-Based Scoring System) with an “A” Level of Evidence. Patients who present with ISSHL should undergo a complete evaluation by an ENT specialist/Otolaryngologist to determine the degree and potential etiology of the condition. Patients with moderate to profound ISSHL should consider HBO2 within 14 days of onset of condition. Medical studies indicated that patients who start early intervention of this condition with HBO2 experienced improved outcomes. The optimal number of HBO2 treatments may vary, depending on the severity and duration of the symptom and patient’s response to the treatment. Utilization review is recommended after 20 sessions of HBO2.